From memory, it's to show the freight car wheels have been inspected for fractures. The yellow spots showed that the work had been done; if a white spot, then the car had prohibited wheels and was possibly barred from interchange. It happened in the early seventies. Brian has it - but I think it's later than his recollection, I think 1978 was the key year, with an FRA mandate in March that year. It was discovered that a bad batch of wheelsets had been manufactured and shipped out to various railroads all over the country, the issue had been discovered by investigating a couple of major derailments, unfortunately it wasn't possible at the time to track down where the bad wheelsets had gone (IIRC better record keeping was also a result!) 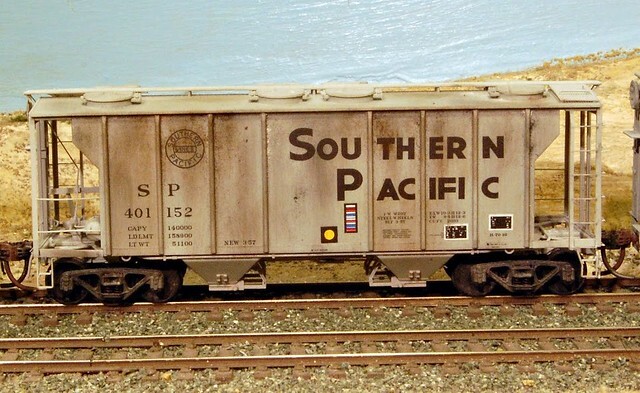 - so the only way to deal with it was to inspect every car that might have received a suspect wheelsets, and a time limit was put out to inspect every freight car that may have been affected. Cars that had been inspected and were okay were given a sticker with a yellow wheel dot on a black background, new-build IPD boxcars built 3/78 to 12/78 should have had yellow dots from the factory. Cars that were inspected and found to have bad wheels were given a white dot on a black background, in effect saying "repair ASAP" with a deadline of the end of 1978, in addition they had a restriction banning them from any train that carried Hazmat. It was only 33" wheelsets affected, so it should only have been 50t/70t cars affected, but I have seen a (very) few images where 100t cars also received a dot. Once the cars had been checked the dots were effectively obsolete, but as repaints aren't over-common I suspect you can still occasionally see them! Info from here: http://www.hosam.com/mod/rsdet.html - also has useful info on things like ACI tags and COTS labels, which are also relevant to the era!